Russia is commemorating the 70th anniversary of the liberation of Auschwitz. 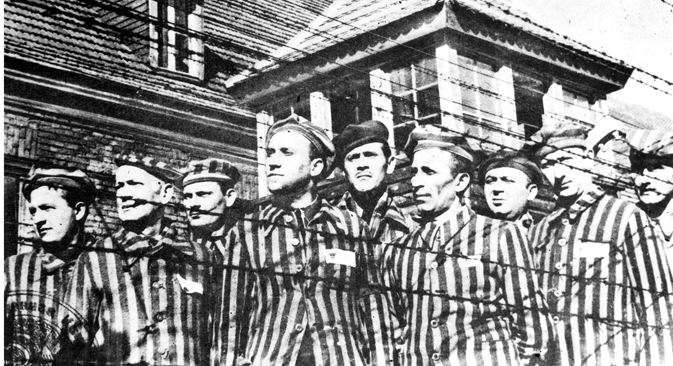 On Jan. 27, 1945 the Soviet Army, under the command of Marshal Ivan Konev, put an end to the largest concentration camp of the Third Reich. Here RBTH publishes accounts of the participants and witnesses of those events. In the second half of the day we entered the camp's territory and walked through the main gate, on which a slogan written with wire hung: "Work sets you free." Going inside the barracks without a gauze bandage was impossible. Corpses lay on the two-story bunk beds. From underneath the bunk beds skeletons that were barely alive would crawl out and swear that they were not Jews. No one could believe they were being liberated. Suddenly I saw silhouettes in a white and gray uniform walking on a road near the camp. It was about 17:00. First we thought that they were camp inmates who were returning. I ran out to see who it was. We were so happy to learn that it was the Soviet reconnaissance units. There was no end to the kisses and greetings. We were told to go away. They explained that we couldn't stay there because it still wasn't clear where the enemy was. We took several steps back and then returned. On Jan. 18 the Germans took everyone who could walk with them. The sick and the weak were left behind. The few who could still walk ran away when our army reached the camp. We immediately sent the sanitary units belonging to the 108th, 322nd and my 107th divisions into the camp. The field hospitals opened their washrooms. This was the decree. The field kitchens of these divisions were responsible for feeding the inmates. There was a lock on the gate. I didn't know if it was the main entrance or what. I ordered men to break the lock. There wasn't anyone there. We walked another 200 meters and saw prisoners in striped shirts running towards us, about 300 of them. We became wary, since we had been warned that the Germans could be in disguise. But they were real prisoners. They were crying, embracing us. They told us that millions of people had been killed there. I can still remember them telling us how the Germans had sent 12 wagons of baby carriages from Auschwitz. I came up to the fence with my unit, but it was already dark and we didn’t enter the premises. We just occupied the guardroom outside the camp. I remember that it was very hot there, as if it had been heated. We even thought that the Germans had prepared a heated place for themselves and then we came along. The following day we started sweeping up. There was an enormous settlement there - Bzhezinka, with impressive brick houses. And as we went through it the Germans started shooting at us from some building. We hid and communicated with our commander, asking him to shell the building. I thought that if we destroyed it, we could move on. But suddenly the commander says that our artillery can't shell the building because there's a camp here, with people, and that we must avoid any crossfire. Only then did we understand what the fence was for. We entered the brick building and looked inside the rooms. The doors weren't closed. In the first room there was a huge pile of children's clothes: little coats, jackets, sweaters, many of them with bloodstains. In the next room there were boxes filled with dental crowns and golden dentures. In the third room there were boxes with woman's hair. And then a woman (a prisoner - RBTH) brought us to a room filled with boxes with women's bags, lampshades, wallets, purses and other leather items. She said: "All this is made from human skin." There's a children's barrack in the camp. Jewish children of all ages (twins) were taken there. The Germans carried out experiments on them as if they were rabbits. I saw a 14-year-old boy whose veins had been injected with kerosene for some "scientific" purpose. Then a piece of his body was cut off and sent to a laboratory in Berlin, while it was replaced with another piece of the body. Now he lies in a hospital all covered with deep rotting ulcers and nothing can be done to help him. There's a beautiful girl walking around the camp. She's mad. I'm surprised that not all the people here have gone mad. On Feb. 5 we headed for Krakow. On one side of the road there were giant factories built by the prisoners that had died a long time ago from the exhausting work. On the other side was another big camp. We entered it and found some sick people who, like us, were alive only because they had not departed with the Germans on Jan.18. Then we continued walking. For a long while we were followed by electric wires on stone pillars. We were very familiar with them. They were symbols of slavery and death. It seemed that we would never leave the camp. Then, finally, we came out and reached the village of Vlosenyusha. We stayed over night there and on the following day, Feb. 6, moved on. On the way a car stopped and gave us a ride to Krakow. We are free, but we still don't know how to be happy. We lived through so much and we lost so many people. This material is based on documents from the Russian Holocaust Foundation and the following memoirs: Before and After Auschwitz by V. Petrenko, I Survived Auschwitz by K. Zhivulskaya and The Black Book by V. Grossman and I. Ehrenburg.